Chronicling the British pursuit of the legendary El Dorado, Masters of All They Surveyed tells the fascinating story of geography, cartography, and scientific exploration in Britain's unique South American colony, Guyana. How did nineteenth-century Europeans turn areas they called terra incognita into bounded colonial territories? How did a tender-footed gentleman, predisposed to seasickness (and unable to swim), make his way up churning rivers into thick jungle, arid savanna, and forbidding mountain ranges, survive for the better part of a decade, and emerge with a map? What did that map mean? In answering these questions, D. Graham Burnett brings to light the work of several such explorers, particularly Sir Robert H. Schomburgk, the man who claimed to be the first to reach the site of Ralegh's El Dorado. Commissioned by the Royal Geographical Society and later by the British Crown, Schomburgk explored and mapped regions in modern Brazil, Venezuela, and Guyana, always in close contact with Amerindian communities. 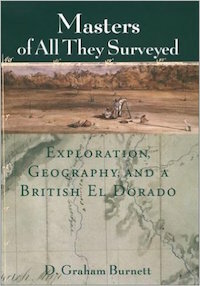 Drawing heavily on the maps, reports, and letters that Schomburgk sent back to England, and especially on the luxuriant images of survey landmarks in his Twelve Views in the Interior of Guiana (reproduced in color in this book), Burnett shows how a vast network of traverse surveys, illustrations, and travel narratives not only laid out the official boundaries of British Guiana but also marked out a symbolic landscape that fired the British imperial imagination. Engagingly written and beautifully illustrated, Masters of All They Surveyed will interest anyone who wants to understand the histories of colonialism and science.